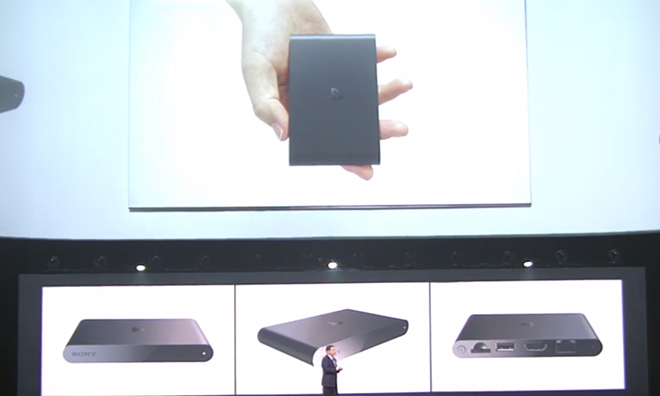 At a press event during the E3 gaming conference on Monday, Sony revealed plans to release the $99 PlayStation TV in the U.S. and Canada this fall, taking aim at set-top streaming devices like the Apple TV. Sony already launched its PS4 go-along in Japan as the "Vita TV" last November, bringing mobile game titles and a limited assortment of streaming movies and music to the big screen. Rebadging the device as PlayStation TV, the company is relying on its gaming chops to expand its footprint in consumers' living rooms. Unlike the Apple TV, PlayStation TV is heavily focused on gaming and will reportedly support 1,000 titles at launch. The device can handle select PS Vita, PSP and PlayStation One classics, while the upcoming PlayStation Now streaming service—slated to enter open beta on July 31 —is expected to grant access to PlayStation 3 games. Finally, Sony's box is able to connect to PlayStation 4 consoles via Remote Play to extend the gaming experience onto other televisions in a household. The PlayStation TV will have stiff competition in the stalwart Apple TV and newcomers like Amazon's Fire TV, the latter of which also sports built-in gaming support. Apple is rumored to be baking iOS game compatibility, as well as motion controls, into a future version of its device that could see release by the end of 2014. Sony's PlayStation TV is expected to hit store shelves at $99 for a standalone unit or $139 for a bundle including a DualShock 3 controller, 8GB memory card, HDMI cable and voucher for a copy of "The Lego Movie" video game.